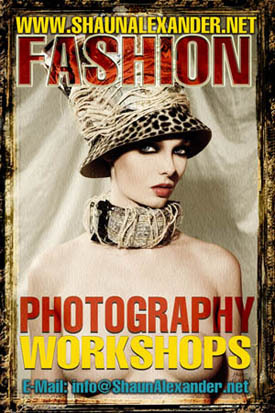 Group & Private Fashion Photography Workshops in Los Angeles by Top Fashion Photographer Shaun Alexander specialized in fashion, advertising, beauty, catalog, product and digital photography. Introduction to photography lighting, styling, model posing, directing, bussiness of photography and much more. Voted best wedding photography studio in Los Angeles, Shaun Alexander Photography offers fashion photography, high-fashion wedding photography, and beauty photography. 1. 100% professionalism – With over 25 years of outstanding photography, this has earned Shaun Alexander the respect and business of thousands of people around the globe, from celebrities to some of the world leaders, princess, kings and queens. These people hired Shaun, not because they did not have any other options, but they hired him because they were confident that he can get the job done as elegantly and professionally as possible, and rise above the occasion each and every time. 2. 100% versatility and charming personality – This is needed to make any occasions and wedding ceremonies, from the most fashionable European and journalistic approach, to the most elegant traditional and religious ceremonies, as well as the most lavish royal weddings. We are experienced and equipped to satisfy any type or style with exceptional results. 3. 100% reliability and service – This means we have one of the fastest turn around time, unlike the competition that will take months or even years to deliver. 4. 100% state-of-the-art equipment, cameras, lights, etc. – This will guarantee brilliant images at excellent quality without much retouching or fake manipulation, unlike the competition which uses the cheapest quality cameras and lenses, and uses a post process to make the images semi decent. 5. 100% creativity – This means beautiful images and moments you could possibly imagine, due to the fact that Shaun is not only a creative photographer, but a painter, sculptor, makeup artist and a beauty master with over 25 years of work and teaching experience. 6. 100% customized wedding albums – This means that we do not use those cheap, common templates like everyone else, but we create the most beautiful layouts that suits your style and vision. Each photo is carefully selected and finished to perfection before it is placed in highly customized album. 7. 100% satisfaction guarantee – This should reassure you that we are prepared to do whatever it takes to earn your trust and business for many years to come, and your satisfaction is our #1 priority. Our clients’ tears of joy is the testament to this statement each and every time. We would like to think of ourselves as someone that will be a part of the happiest times of your lives, capturing the most beautiful moments, and putting them in a time capsule for eternity. We will provide ageless, flawless, and elegant images that will melt your heart each and every time you look at them. Our satisfaction rate so far has been excellent. There is nothing that we cannot do, customize or create. From the most beautiful pre-wedding portraits, slide show creations of your childhood, to the most romantic on-location or studio engagement portraits, we can do it all. We can even make a realistic oil-painting-style portraits on canvas as big as the Empire State building. This is to show you that there is nothing we cannot create; the sky is the limit, and we are able to bring your imagination to life, and capture them forever. Having said that, we also do understand that each and every couple have certain needs and demands, and our customized packages are guaranteed to fit every style or budget no matter how big or small your wedding might be. We would happily provide you with all digital files, so you can print your images at your leisure, or you can let us create the dream albums for you. You will have a luxury wedding album, truly a piece of art. Perhaps the one of the most beautiful, durable and impressive wedding album that money can buy. Each page is carefully designed, and each photographs is printed on to the pages itself on excellent quality material laminated for any kind of stain, fingerprint or accidental spills. You can simply take a wash cloth, and clean the pages without a problem. The front cover comes with one-of-a-kind one-fourth inch thick glossy acrylic cover with a beautifully created cover page from one of your images, or your rings, or any images that you desire. We can create a beautiful cover which will be imprinted on to the shining and brilliant acrylic, which makes this album one of the most beautiful wedding albums you have ever seen! Thank you for trusting us for the most beautiful day of your life, letting us do what we do best. So you can relax and enjoy this very special day, and cherish those images forever. We are honored to be a part of your life celebration. Top Fashion Photographer Shaun Alexander presents his latest Fashion Campaign – Catalog LA Chatuise Evening and Bridal Gowns Collection . Fashion Photographers Blog page for Fashion lovers and fashion experts, fashion magazines industry, fashion models, Fashion agencies and anyone with the love and passion for fashion.